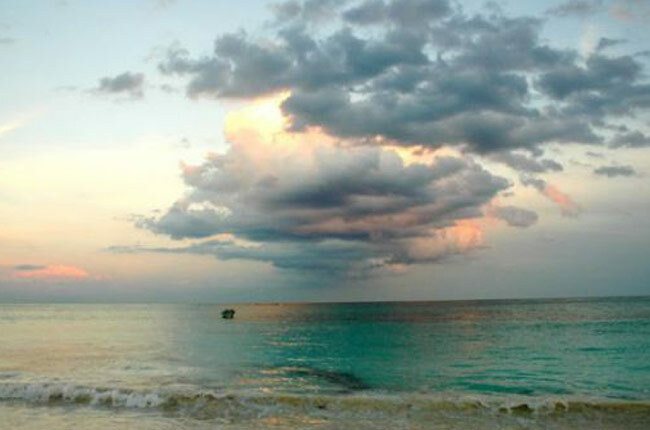 Gorgeous beaches from Tulum to Playa del Carmen. 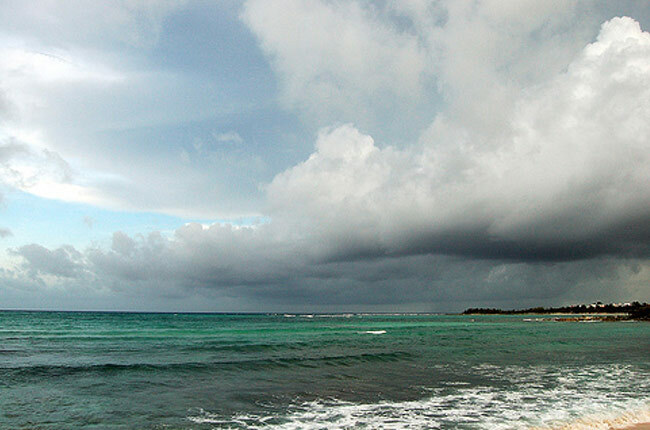 The coastline of the Riviera Maya stretches from Cancun to Punta Allen. Along the way, are a mixture of bays, limestone shoreline and wide sandy beaches. Most of the bays are protected by an outer reef that reduces the surf and encourages sand to collect on the beaches, however, the water entrance to many of these can be rocky, therefore reef shoes are recommended. Snorkeling and kayaking are best in the bays for novices, outer reefs and ocean kayaking are great for those with experience. 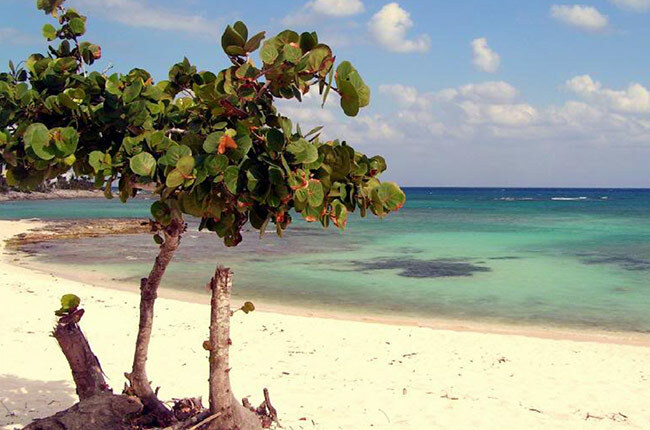 Akumal, Puerto Aventuras and Soliman bays are examples of beaches with an outer reef break for protection. In areas of the coast where there is no outer reef the waves come in directly. This effect creates wonderful sandy beaches that are wide and long. In the rocky areas, the waves crash into the shore creating a dramatic show with the Caribbean Ocean as a backdrop. 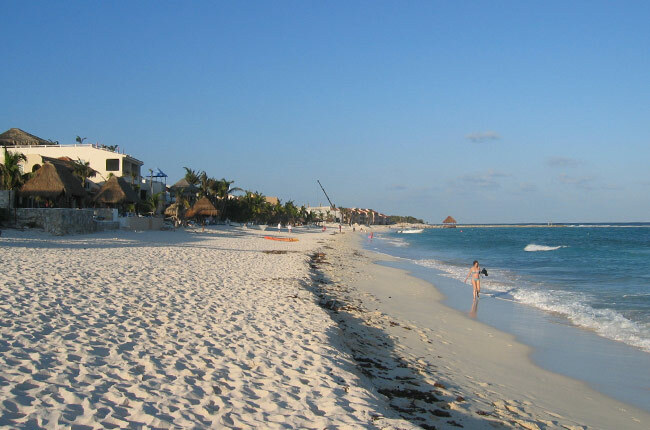 Xpu Ha, Tulum and Playa del Carmen are good examples of beaches with open water exposure. All of these beaches do however have some coral formations and are good for snorkeling as well. Occasionally, there can be an undertow in open ocean and the both bays and beaches, know your and your children's abilities and swim accordingly. 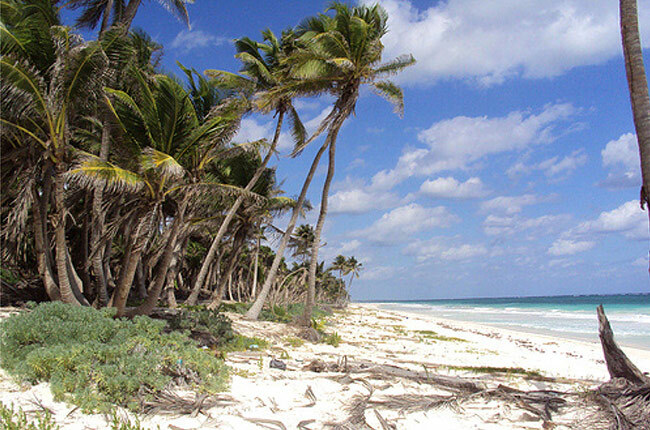 Starting with some of the biggest and the best, Tulum has some great wide open expanses of sugar sand beaches. The beach road is lined with numerous Eco-hotels and beach clubs and most have great beaches. 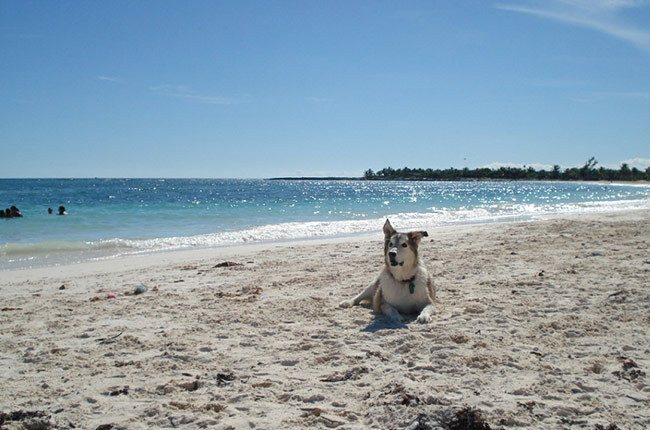 The coastal biosphere reserve Sian Ka'an was put created by the Mexican government for both ecological preservation and sustainable use by the public. Mayan for "where the sky is born", Sian Ka'an's entrance is located at the south end of the Tulum beach road. The road turns to dirt past the stone archway and leads travelers through the jungle and along deserted beaches. Moving north is Tankah, a reef protected beach that is less traveled. Great for a day trip with decent snorkeling, lunch at Blue Sky restaurant and/or a refreshing dip in Manatee Cenote. Soliman Bay has a white sandy beach and is mostly undeveloped with only a few private beach houses nestled among the coconut palms. There is excellent snorkeling and a small private dive shop at Palapas Caribe that offers ocean diving and private scuba classes. A well protected bay with good entry makes kayaking a popular activity here. Aventuras Akumal is a wonderful stretch of beach in between Soliman Bay and South Akumal. Open ocean waves create a fairly wide, super sandy beach that is great for strolling and lounging in the sun or shade. Decent snorkeling and low crowds make this a nice spot to spend the day. While all beaches in Mexico are public, easy access to them is not always available. 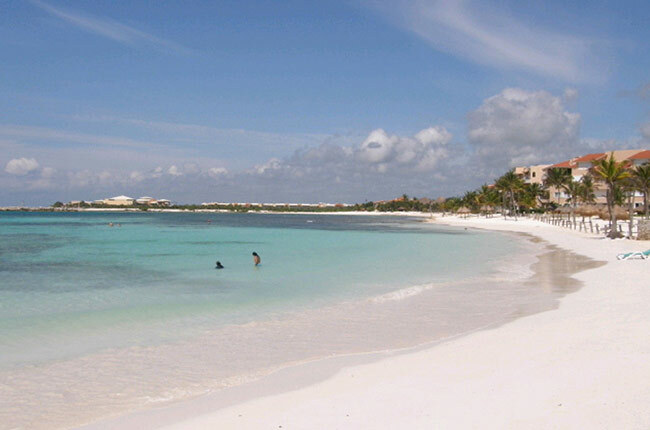 This is the case with South Akumal beach. The beach is lined with mostly with private homes, some of which are available for vacation rentals. If you are seeking quiet seclusion for you and your guests, please view our listings in the area. South Akumal is 3 km south of Akumal. Jade Bay is similar to its neighbor just to the south. Mostly private homes on a protected, sandy beach, with limited public access. Sol Maya offers villas for vacation rentals on Jade Bay. 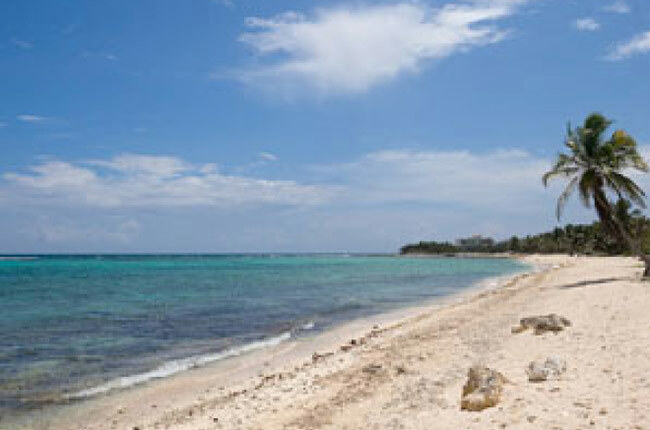 Just to the north of Akumal Bay, Half Moon boasts a nice long stretch of beach with excellent snorkeling and kayaking. 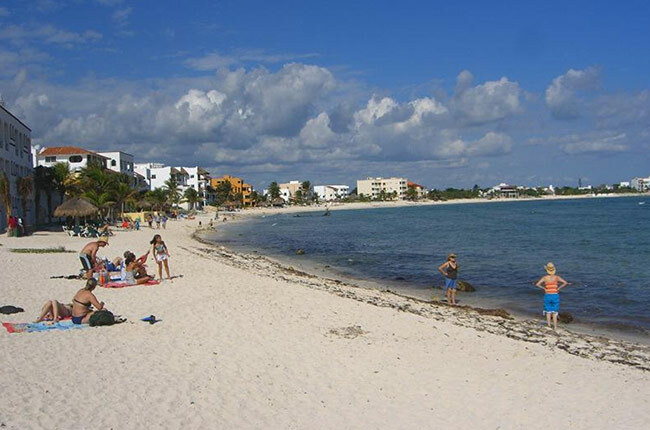 Many of our Akumal condos are located here and all are within walking distance of two beach front restaurants. Xpu Ha, (pronounced "eesh-poo-ha") is the next jewel on the ring, could be the diamond! 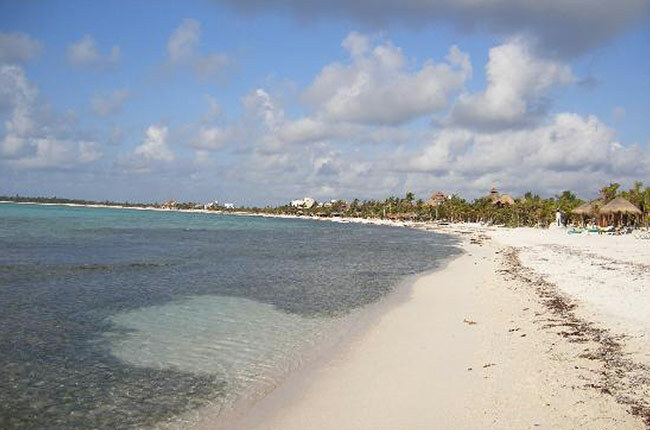 Located 10 km or so north of Akumal, it is another sugar sand beach with wide open ocean vistas. Facilities include dive shop, kite boarding (seasonal), restaurant/bar (live music Sundays), and camping. A wonderful spot for adults and children of all ages. 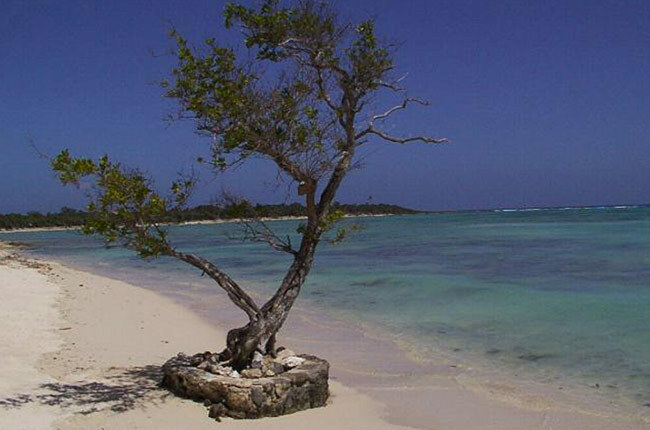 X'cacel (pronounced "eesh-ka-cell") is gem of a beach that stands still in time. 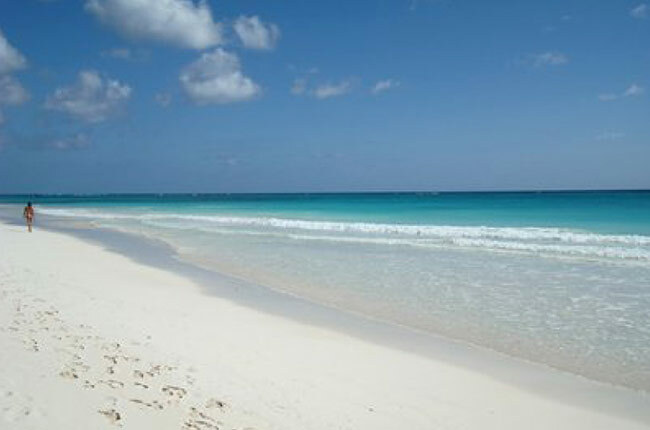 Incredible white sand flows into gin clear water or vice versa, on a perfect day it is hard to tell! Semi deep water coral formations offer little resistance to ocean waves rolling in onto the beach. With no facilities and so far undeveloped, X'cacel is a huge nesting beach for several species of endangered sea turtles. Popular with both locals and travelers, this is one not to be missed. Puerto Aventuras is a gated community with a mix of small hotels, private villas and condominiums. It hosts the largest Marina between Cancun and Belize and has a wonderful beach on Fatima Bay. Well protected by a coral reef that offers top notch snorkeling, it is a good spot for families with kids. Beach access is through the Omni hotel or just to the north past the row of shops. Just north of Puerto Aventuras is the funky village of Paa Mul. An eclectic mix of Palapa/RV homes, a small condo complex and a few private villas encompass the area. The beach is nice, sandy and rarely very crowded. An ocean front restaurant with pool will serve your needs for sustenance and the snorkeling is good as well.